Barcelona is a must-see destination for many a traveller – and with a European cruise from Cruise 1st Australia, you could visit this wonderful city plus a whole lot more. Take a look at our latest cruise deals for cruises visiting Barcelona – or keep reading to find out what you can expect to see and do in the legendary Catalan city. Madrid may be Spain’s capital city, but Barcelona is arguably the most famous, the most diverse and the most beautiful. Situated near the north east coast of Spain in the region of Catalonia, Barcelona has a rich cultural heritage that is evident throughout the city. Take a walk through the centre and you’ll be surrounded by beautiful architecture and monuments to the past. Arguably the most interesting building of all is the Minor Basilica of Sagrada Familia, a gigantic cathedral that began construction in 1882 and still won’t be completed until around 2028. 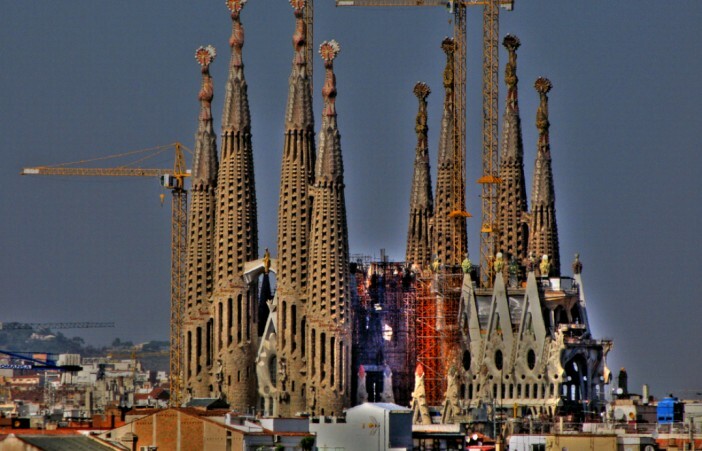 It was designed by Catalan architect Antoni Gaudi and is still being built to his vision. Despite its incomplete status it is a stunning sight, towering over the city with its distinctive turrets and minute attention to detail. Also worth visiting is Camp Nou, home of the world famous Barcelona soccer team – you’ll feel a sense of the history and the energy of a live game, even in a nearly empty stadium. The National Museum of Art of Catalonia is another great place to visit, for the building as well as the art it contains. You’ll also find plenty of examples of fine Catalan cuisine – good restaurants are dotted throughout the city although you may want to travel outside the very centre for the real gems. We’ve only scraped the surface of what makes Barcelona such a great place to visit – but rest assured you’ll never find yourself short of things to see and do. After a flight from Australia to Spain, you’ll set off on a cruise from Barcelona which visits Chania (Crete), Ashdod (Israel), Aqaba (Jordan) and Dubai. You’ll then fly back to Australia. After a flight from Australia to the UK, you’ll embark on a cruise from London which visits Southampton, Vigo, Lisbon, Cadiz (Spain), Gibraltar, Barcelona, Chania, Ashdod, Aqaba and Dubai, before returning by flight to Australia.